A late post today! I've been busy reorganising my craft space & unpacking my order that I received last week. Check out my Facebook page if you would like to see what I got! I also showed off a few of the goodies I got from OnStage last week! 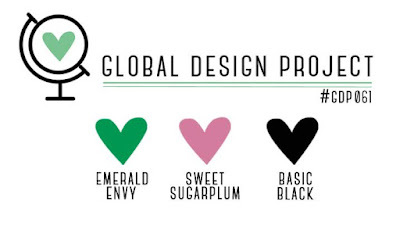 Today the Global Design Project #GDP061 was a colour challenge of Sweet Sugarplum, Emerald Envy & Basic Black. I thought this colour combo would be easy but I had a hard time coming up with something that wasn't too overpowering! I'm really happy with this card I've come up with & it was also really easy to put together, thanks to a couple of new sets of thinlits I got! I have used a Basic Black cardstock base, with a layer of the Sweet Sugarplum floral pattern paper from the Blooms & Bliss Designer Series Paper & then I have cut out the flower & butterfly thinlits from the Sunshine Wishes thinits in Basic Black & the Thanks sentiment from the Hello You thinlits in Emerald Envy. I have also put some Clear Wink of Stella on the butterfly but it hasn't shown up in the pic. I finished the card off with the Metallic Black Thread & I've used about 6 strands of it. I hope you have enjoyed this card! I have also entered it into the Crazy Crafters Team Highlights tonight. You can see them all & vote for your favourites from 7.30pm AEDT tonight.